Here are a three different methods of creating bobbles or popcorns. Note: These show on the knit side of your knitting. 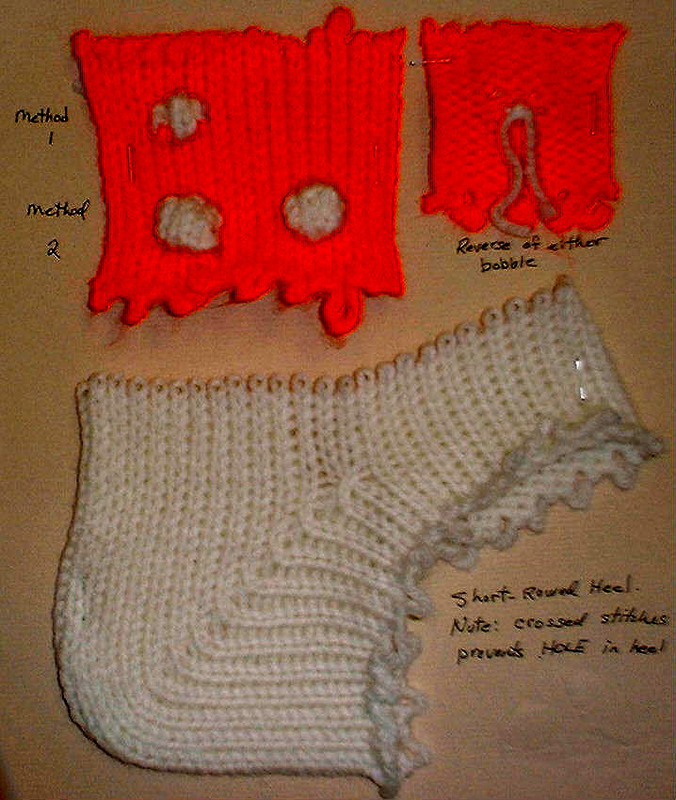 Method 2 and 3 look virtually the same but method two uses 2 colors of yarn, and method 3 uses the same color of yarn. -Pick out where you wish your popcorn to be on your knitting and pull out the center needle. Knit this stitch by hand 3 times. -Now, put the outside 2 needles back and just knit on the center needle for 3 more times. Return this needle to original position...bobble now completed. -Use separate yarn for each bobble whether it is same color or cc. -Decide where each bobble will be positioned in the row and mark 3 needles at each position. -****Put all ndls ito Hold to the right of the first marked bobble position---3 ndls in WP, COL.
-Leaving a 3" yarn tail, K 9 rows (or uneven number of your choice) over 3 bobble needles, holding the sts down with your finger or a transfer tool so they don't pop off the ndls. End with COR. -Put next ndls to the left of the first bobble PLUS 3 needles for the next bobble into UWP. _After last bobble is complete, and has been rehung, return last ndls to UWP and complete the row with the main yarn and finish knitting the row to the left. This method uses the carriage in hold position and you knit the bobbles with the carriage. Choose where you want your bobbles to be...note down rows and needles on your pattern somehow to plan your garment. For this method, 4 stitches is the width of each bobble. -Repeat from **** to **** until all bobbles are done, finish the row and advance the row counter the one row you have just knit and engage your row counter again and proceed with your knitting. This is a very detailed and good method of shortrowing the heel or toe of a sock or slipper and preventing the hole in the heel and also making sure both sides of the sock are the same length so seaming works out correctly. Hang 3 claw wts and move to keep wt on working sts so they don't pop off ndls. COL, pull ndl nearest carr into HP, K 1 row to the right. Continue putting carr side ndl into HP, and knitting one row until about 1/3 of heel/toe sts are still working. End with COR. There should be the same number of sts in hold on both sides of heel/toe working needles right of "0". Begin increase. Be sure to have weight at center of working sts and 2 more wts at either side. This next step is extremely important!!! Bring next ndl nearest carr in HP, and at the SAME TIME, push ndl in HP opposite carr into UWP. Move wts so that all sts knit that should. Repeat from * to * until 1 ndl is in HP at the right next to carr. Note: there may still be a small hole at the inside point of the shaping. To take care of that, before you make the final pass of the carr, you can remove the 2 sts on either side of "0" ontoTwo 1- prong transfer tools and cross them. Then make the final pass to the left over all the needles.